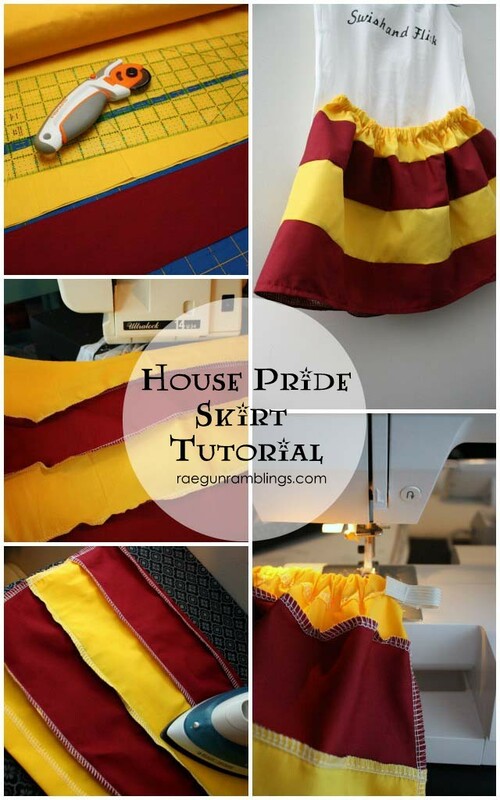 Today I’m excited to be sharing my House Pride skirt tutorial as a part of Simple Simon and Co’s Skirting the Issue Series. If you’ve never heard of the series it’s a month full of skirt tutorials with the purpose of helping people sew skirts for girls in foster care. Joining in is easy simple sew a skirt (or a hundred) and then donate it to a charity of your choice or if you’d rather you can mail it to the Simple Simon girls and they can take care of the donating. Also make sure to upload a picture of what you donate for a chance to win some awesome prizes. See this post for more details! Cut strips to make up your skirt. To figure out how wide you want your strips to be decide how long you want the skirt and add 3 inches for your seam allowances, hem, and casing. Then divide by the number of stripes you want and cut your fabric to that size. Mine was a 3T and each strip of fabric was 3.5 inches wide by 44 inches (the width of my fabric bolt) long. So I needed just 7 inches of each fabric so 1/4 of a yard of each would have been more than enough. See this chart for some general measurements for different sizes. Sew the stripes together to form a striped fabric. Finish the seams with a serger, zig zag, or overlock stitch on your sewing machine. Then sew up the short side to form a tube. Finish both edges and fold the bottom edge under 1/4 inch and stitch around to hem. Fold the top edge under 1 inch and sew leaving a hole for your elastic. Thread in your elastic and close up the hole in your casing. 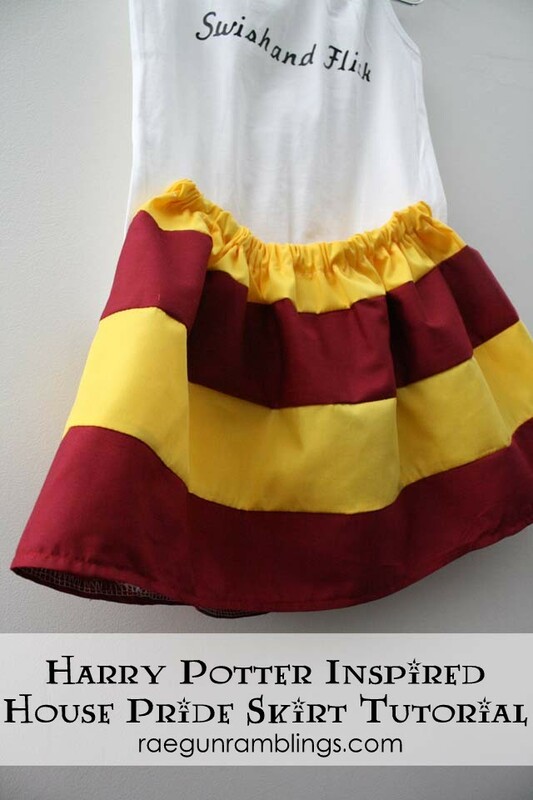 Make this skirt for your favorite Harry Potter fan, switch up the colors for other occasions, how cute would it be in black and white or mint and navy. And since it’s so quick make a few for some foster kids just in time for the new school year. I paired it with a simple tank that I bought from Old Navy and added a little iron-on vinyl “Swish and Flick” saying to with my Cricut cutting machine. 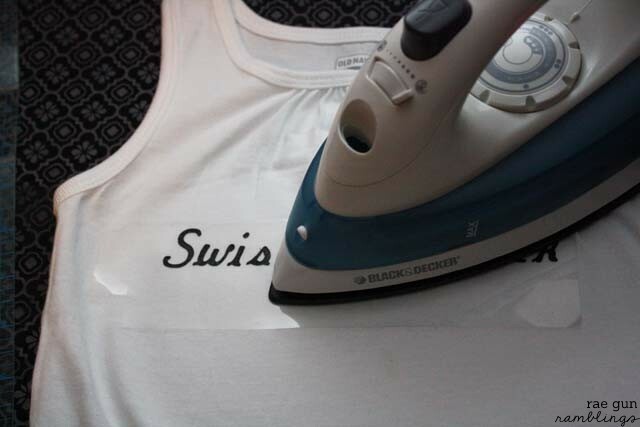 See how to use iron-on vinyl here if you’ve never played with the stuff. It’s kind of my favorite and it’s such an easy way to personalize anything! Be sure to visit Simple Simon and Co all month to see tons of great skirt tutorials. And just for fun here are a few other skirts tutorials that I have that you can use if you want to join in on sewing for the girls in foster care! 30 Minute Elastic waist skirt. The adult size takes just 1 yard of fabric. Make it kid size just by using 44 inches as the width and adjusting the length to whatever size you want. 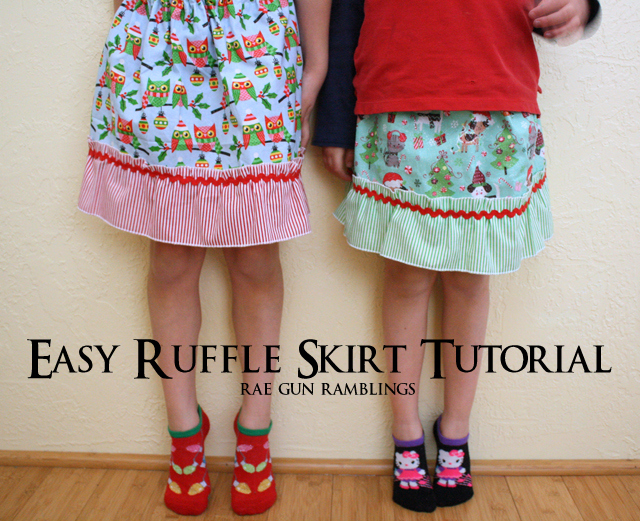 An easy ruffled skirt tutorial. This is so easy my nieces each made their own! 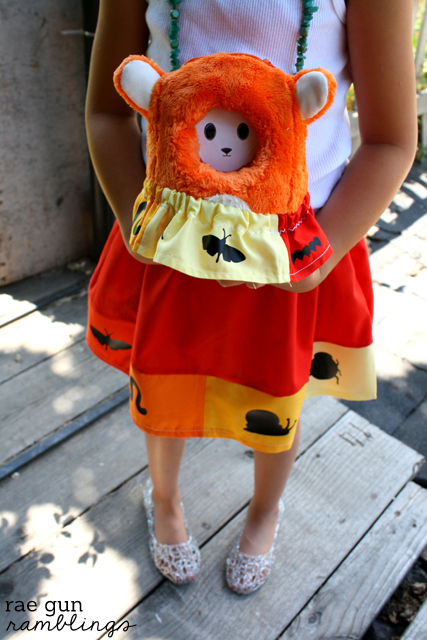 Simple pieced skirt with iron-on vinyl detailing tutorial that you can make in toy size to match your little one! 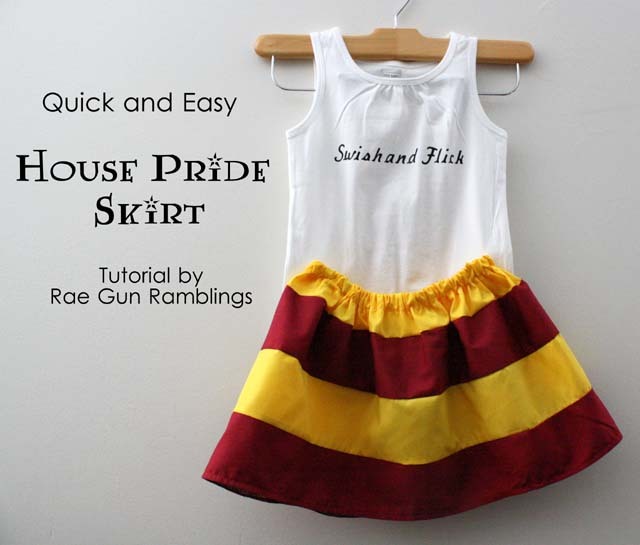 Oh goodness…perfect shirt to go with a Harry Potter skirt. My girls must may need one. Super cute! Love the skirt, worked out great! Thanks for the tute and instructions! I’m totally making these for my girls! Just need to decide on colors. We were a Gryfindor family but Pottermore changed that. I may have to make both! But at 20 minutes each, I think even I can do that!